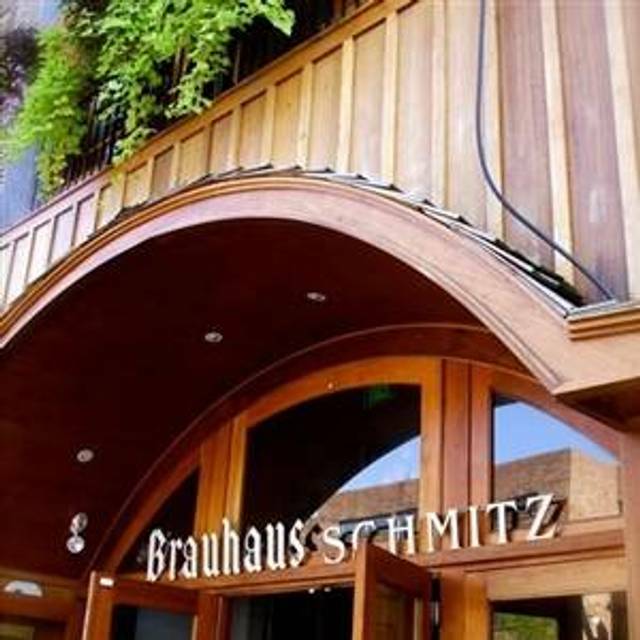 You must make reservations at least 5 minutes in advance of the time at Brauhaus Schmitz. Went on a Friday night with reservation. Service was incredibly poor, was checked on maybe once during the meal. Appetizer came out the same time as entrees, and cold. It was a pretzel so I really can’t imagine it being that difficult to prepare at the right time. Food was good for what it was, but was everything was priced about $4-$6 higher than it should’ve been. Beer selection was great though. Come for drinks - pass on the food. The food and drinks were very good. We'll be back! Great choice! The beer was excellent, the food was excellent, and the service was very good. We were completely satisfied with everything. Definitely recommend, would go again next time I’m in town. Really good German food. Everything I wanted from that experience. I love the authentic food and imported beers. Definitely feels like I am back in Germany. Sometimes a little noisy, but that should be expected. Always a good meal and great service. Great beer menu!! Had great birthday dinner with my family. Brauhaus has definitely gone down a few notches compared to previous dining experiences at this restaurant. My husband and I LOVE German food. I found this restaurant on the Open Table site as we are season ticket holders at the Walnut Street Theatre and we try a different restaurant every time we drive in. I was so excited to try this restaurant. We sat upstairs and had a great view of the rest of the bar and restaurant. We enjoyed the view. Our server had no personality. She didn’t smile, never asked us once if things were satisfactory or if we needed anything. Maybe that’s because people must complain constantly. We ordered appetizers. I ordered the bread dumpling which was very good. My husband ordered the pretzel, which he said was ok. He said a WaWa pretzel is better. Lol. Then came our entrees. My husband ordered the sauerbraten. He spit out almost every bite he took as it was extremely tough. He said the gravy was very good..Lol. He also enjoyed the dumpling. The pickled cabbage was raw and not enjoyable. I ordered the house special pork loin. It is huge!!!! I took my first bite and it would have been amazing if it weren’t extremely salty! 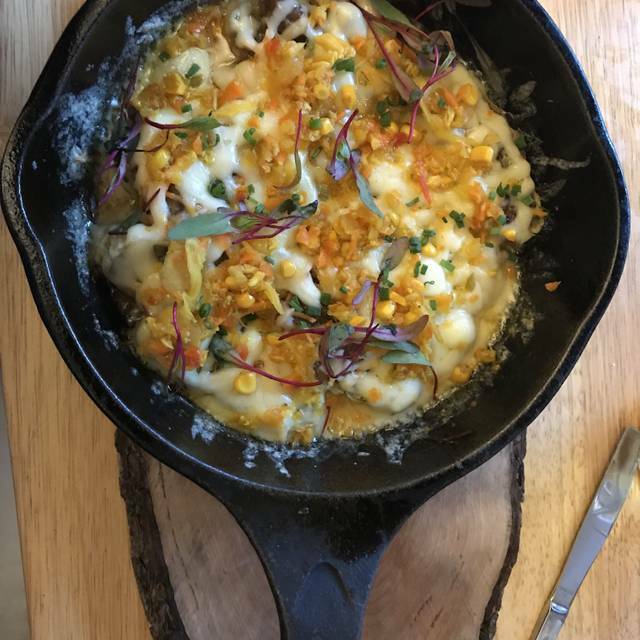 I ordered spaetzle and it was just ok. 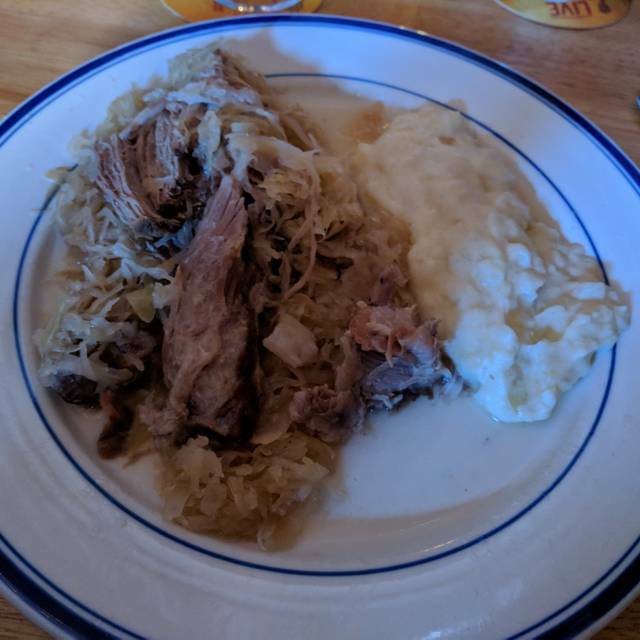 The sauerkraut was extremely sour, but my husband enjoyed it. Our server never even came by the entire time we were eating and when she finally did, she didn’t ask if everything was satisfactory, even when we didn’t want to take anything home. We then asked her to recommend dessert. She recommended the hazelnut mousse cake. We cut into it and it was dry! How is mousse dry? The tip of the piece and the top were completely dry and if you peeled away at it the center was actually moist and tasty. Needless to say this was an extreme disappointment for us and we will continue our quest to find a great German restaurant. Unfortunately, they are few and far between and this one will definitely not make the grade. I guess they concentrate on being a Biergarten and not a true restaurant. We don’t get to go out on special nights without our kids very often. This was super exciting for us because my husband planned the whole night and I LOVE German food! Our experience didn’t disappoint! Diamond was our server and she was over the top AWESOME! She was attentive, recommended great things to eat and drink and was on top of it! We will definitely go back again!! My husband and I came here this Saturday before St. Patrick’s Day so it was quite loud. We were seated upstairs and that was appreciated. We started off with the Bavarian Cambert and that was absolutely delicious. My Jagerschnitzel although tender was a little bland compared to the vegetables. 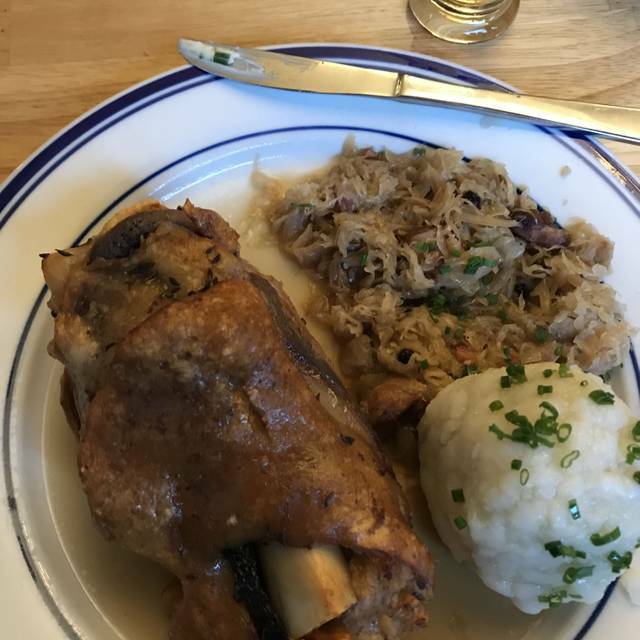 My husband didn’t care for his Schweinshaxe. I thought it was delicious but I am more adventurous when it comes to trying new foods than my husband. I was happy that he decided to come with me. He said he would return but he would try the sausages. Our server was very polite and attentive. Overall it was a pleasant experience for me and if you’re ever craving German food, this would be the place to go. They have many options on the menu and you should just continue to come so you can try them all. The beer selection was enormous but we were driving so we drank soda. Check them out. You won’t be disappointed. Nice German meal for our visit to Philadelphia. Loved our beer and schnitzel. Love it!! It is our "Cheers!" There are so many beers to choose from! I had the sauerbraten and my dinner guest had hasenpfeffer. They had a quite extensive beer list and I chose a pilsner which was good. The sauerbraten was good but the hasenpfeffer was bland. The waitress had zero personality. She took our order, never came back to see if everything was alright or if we needed anything. We had German plum cake for dessert which was good. When the waitress came with the check she just put it on the table and walked away. I paid the check with a credit card and like she did with the check she just came back with the receipt and laid it on the table without even thanking us for coming there. Needlessly to say with such a bad attitude I gave her a low tip. 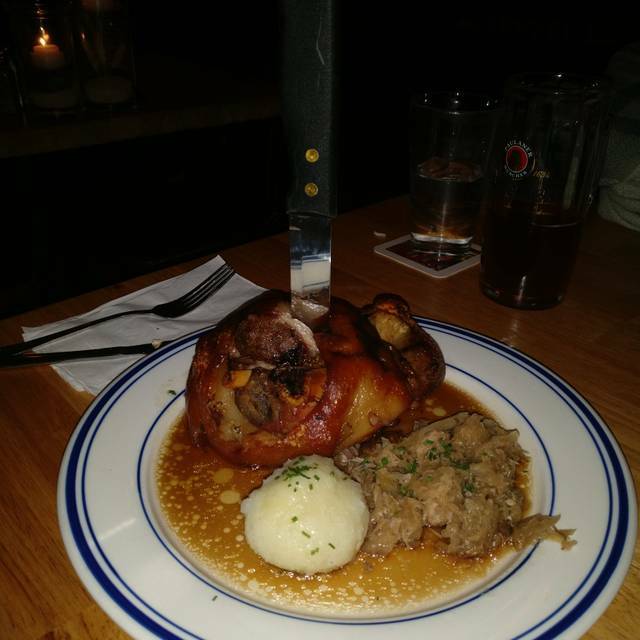 If the hasenpfeffer was not bland and had we a friendly server, I would have given the Brauhaus a higher rating. I cannot say it was a good value as my sauerbraten was $25 with no sides and a small portion. The hasenpfeffer was also $25 and definitely not worth it. Delicious food, great time. The butchers plate is amazing. Will be going again. 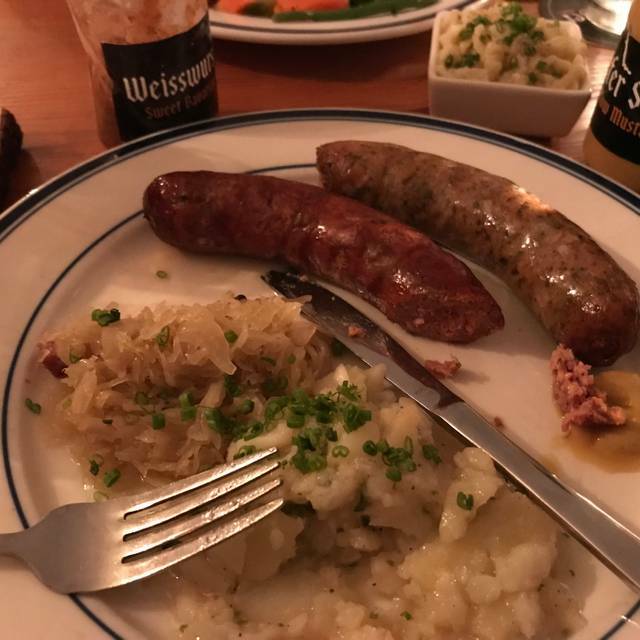 Brauhaus Schmitz never disappoints. Their food is excellent and the beer selection is top notch. The servers here are good at their jobs and attentive without being overbearing. I highly recommend trying this place! 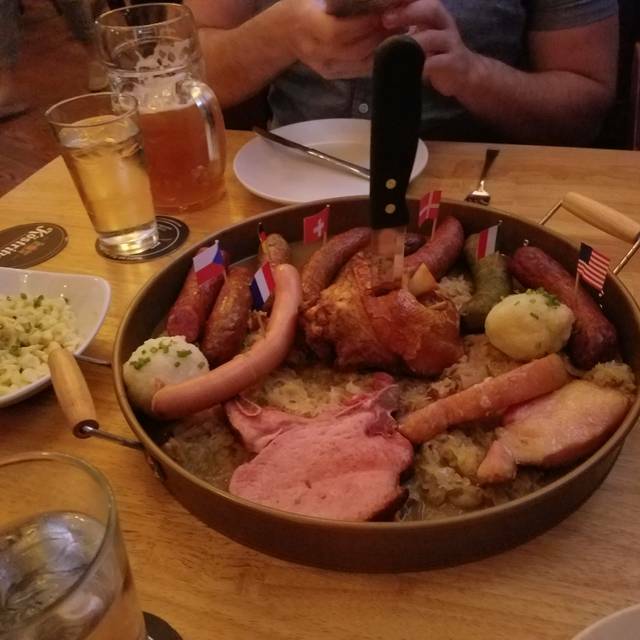 Delicious German food with a great beer menu. Good food at very reasonable price. Lively entertaining atmosphere. Loved the accordion! Attentive professional staff. I made reservations for 8 over a week in advance. We were seated at a table right by the front door. Every time people came in the front door it was freezing. We asked to be moved, but it wasn’t possible. After waiting, we had to ask for a server. We ordered some apps, then our meals with several sides. Our meals were served, but the sides were served when everyone had finished their main course.... we questioned this a couple times during the meal. Our family was there celebrating their dad’s bday... it was his choice to go there because he wanted German food. Overall, it was a disappointing experience & probably won’t be back. We chose the 9 sausage platter with sides of German potato, sauerkraut, red cabbage and spaetzle. All delicious! Sampled several of the German beers on tap, all great, and not found other places. Service was reasonable attentive considering that the place was PACKED - live music in one room and every seat occupied. The noise level was very high and made it difficult to converse with members of our party. Overall a VERY good experience. We will go again! 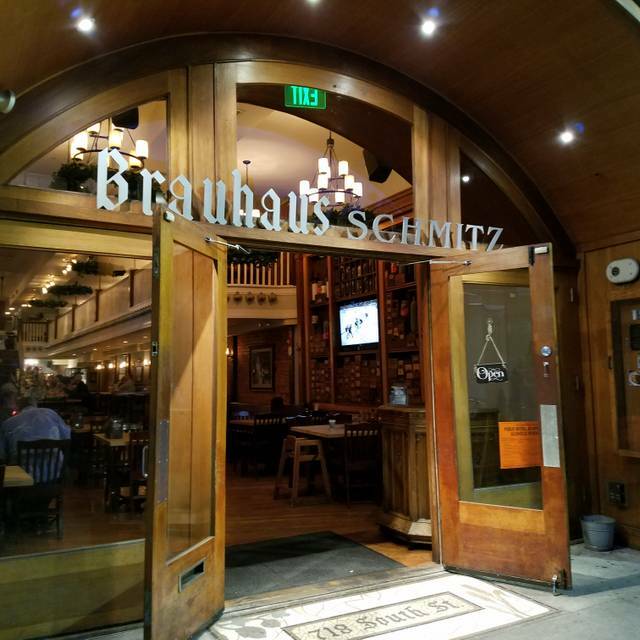 Love the experience at Brauhaus Schmitz. Went to celebrate my birthday and enjoy the Starkbierfest. If you like traditional German Beer it is a can't miss place. The food is modern take on German and is quite tasty and filling. Can get loud when there are events, OOMPAH Bands will do that. Great Time! Great staff. Outstanding atmosphere. Every time I go there I remember why I love it so much. Very very good food menu and the beer selection was unparalleled. Such a good time here. Came for the dark beer fest, stayed for the food and service. The Jaegerabend evening of game meats and beer pairings was magnificent! Good food and drink, and a great group of friendly people. Great Restaurant with an extensive beer selection and nice chose of German food. Nice atmosphere. Thanks again for a great experience. The service provided by our server, Gina, was outstanding, and the food was excellent, as usual. Went for Lunch with out of town friends. Was not rushed at all. Two types of beer were great. Jaeger schnitzel and 2 wurst platter were awesome. Great lunch! We have made a tradition of going here on my birthday for the past 3 years now. Food and service is always fantastic! Only gripe was this year, we had reservations and still had to wait about 30 minutes to sit. Otherwise, great as usual. The place is really nice and the atmosphere great; the beer selection is unbeatable. The quality of the food, on the other hand, goes down dramatically since my last visit there, about 2 years ago. In particular the veal Schnitzel (one of their signature dishes) was simply BAD. The chicken was barely warm. Two of our guests ordered a sausage sampler, and the same sausage on each platter tasted "off". Our group had all been to BS in the past and always enjoyed the food. The beer was exceptional and the atmosphere was enjoyable. Very good piece of Germany in South Philadelphia. Reminds me of the Rathskeller in Munich. The Veal used in the Weiner Snitzel was not prepared as well as it could have been. Should have been thinner as most good Snitzels are prepared. Potato pancake was very bland, actually the worst that I have ever experienced. Sad, could have been a great experience too! 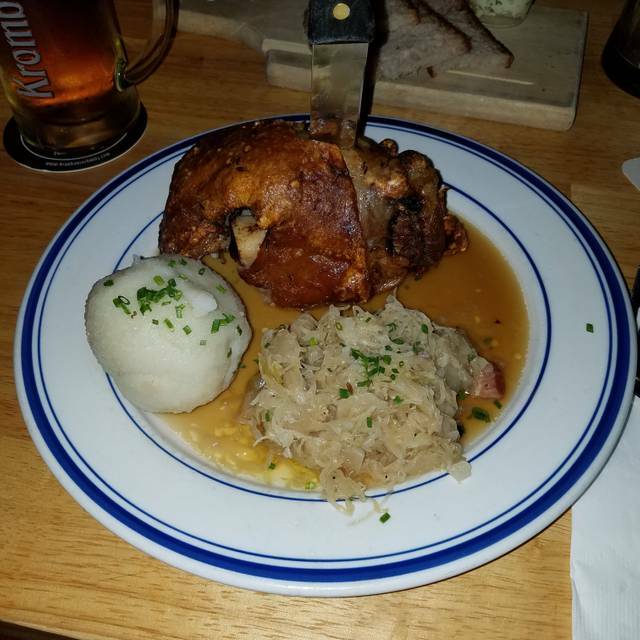 Not many places in the Philly area for good German cuisine. This was a joy to find. The service was good and so was the food. Though I am not an alcohol drinker, there is an extensive beer list for those that do. Will definitely go back again. Definitely plan to come back. Food and service was excellent!